Finding answers to frequent questions like why an account saw an increase/decrease in clicks or conversions is tedious. A drop in conversions or clicks can be attributed to multiple elements like keywords, placements, or an entire network, which makes answering such questions difficult and time consuming. Optmyzr has automated this investigation process through its new PPC Investigator tool. If someday, your account experiences a sudden decrease in clicks, just ask PPC Investigator what brought on the change and you will get an answer within seconds. 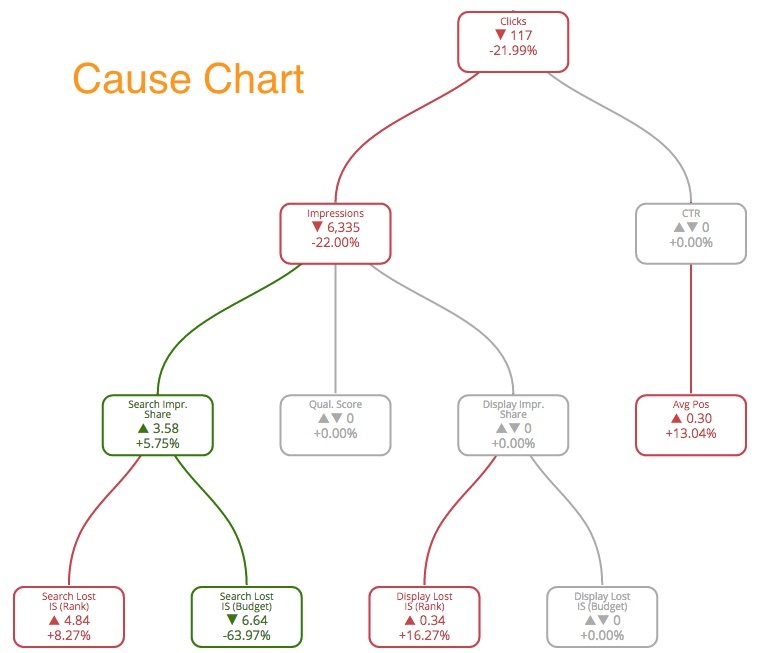 The Cause Chart breaks down a metric’s performance into its underlying related metrics and highlights the metric that impacted performance in red. Analysis from the Cause Chart can help find those areas in an account that can benefit from a bid or ad optimization. For example, if conversions dropped and the underlying reason is identified to be an increase in impression share lost due to ad rank, a bid optimization will help. Subject to availability of budget, an account manager can choose to bid higher for better impression share, higher CTR and more conversions. But wait! That’s not all! PPC Investigator also helps in examining and identifying the positive and negative top movers in an account. It shows the elements in an account (keywords, ad groups. campaigns) that were significant contributors to the change in the account over a period of time. This analysis is available under the Root Cause Analysis tab. Identify the pain points which impacted account performance to streamline workflows. You’ll know exactly which keyword or ad group caused the change and needs to be investigated. Check the impact of paused campaigns/ad groups/keywords and make a decision on whether you would like to enable them or keep them paused. These are keywords or campaigns that shows a 90-100% drop. Find optimization opportunities by viewing the networks or devices that might be pulling down the performance of an ad group or campaign. Read more about the PPC Investigator here. You can try it out in your Optmyzr account under the Data Insights tools.